Resources - Deb Arnold, Ink. Deb has amassed extensive award experience and insights, and is now sharing them with you in downloadable formats that are available immediately and priced for value (some are even free). Many more guides and tools are under development, so check back soon or contact Deb for more info. Deb’s premier resource is a colorful, engaging 16-page guide brimming with insights, common sense advice and aha moments gleaned from 35+ awards wins. Whether you’re contemplating your first award submission or your 50th, this guide can help. See a “cheat sheet” version below. 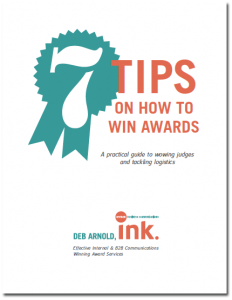 Benefit from Deb’s experience with custom guides on how to approach an award, including applications with my question-by-question notes, guidance and suggestions. Deb’s stellar T125 track record includes the #1 and #2 spots (twice each), an average 44 spots improvement on the 2014 award, and multiple Best Practice and Outstanding Initiative Awards. Companies can access Deb’s T125 expertise via digital download and a limited number of value-priced coaching packages that include these valuable resources. Superb guidance from a seasoned expert can be all yours. Highlights include: all scoring guidelines, what’s new this year, and two Best Practice Award winning entries PLUS all-new offerings to help you maximize your score. You can purchase Deb’s resources as a DIY option or as part of an exclusive coaching package (limited availability) including three one-hour phone sessions and feedback on select responses. Have in-house talent who can do the job? Just want some solid insights? These tips for crafting successful award submissions will come in handy. 1. Know who you’re talking to: #1 rule! Most awards offer explicit criteria, thus telling you, more or less, who they are (i.e. what they value, want to know, etc.). To win, listen closely and obey: filter your descriptions through their lens. 2. Read the questions. Yep. It’s too easy to get caught up in your fantastic program/team/company and forget exactly what was asked. 3. Start early. Allow for research, interviews, number crunching, exhibit prep, revisions, proofing, etc. For online submissions, wisely leave time for technical snafus. 4. Tell a good story. Weave a compelling narrative. Add some drama. Yep, drama. After all, you did something important, right? 5. Keep it simple. Make your narrative easy to follow. Use plain English, and avoid the quirky lingua franca spoken on your corporate planet. 7. Use metrics wisely. It’s all about metrics, but they have to be meaningful. “Revenue increased by X%” is nice, but “Revenue increased by X%, beating targets by Y%” packs the punch. Check out detailed descriptions of each tip on Deb’s blog or download the free guide.